I am in Scotland right now and will be until March. It’s cold. The Scots are saying it’s been a warm winter so far. For me it’s still freezing cold. I brought a bunch of accessories that I normally wear. Mistake! They don’t work in cold weather. Gloves don’t slide on with chunky rings. Thick scarves and necklaces get into a tangled mess. Fancy hairclips and woolly hats create hairdo disasters. Yup, my wardrobe and thinking is rather based on our South African climate and hopelessly inadequate here. Greenie Dresses for Less got a mention in the February issue of Glamour magazine. I can’t begin to say how pleased I am. The point of this blog has always been to show people how dead easy it is to recycle old clothes into updated versions of themselves. My photos aren’t going to win any awards and I prefer to use a model than pose in my clothes. The blog isn’t about me. I am hoping that Greenie Dresses for Less will inspire people to renovate a much loved pair of boot leg jeans into skinnies or tie dye an old sheet into a distressed style scarf. DIY fashion is sooo easy and I hope to keep sharing ideas so you can upcycle, recycle or make your own clothes and accessories. I would love to see other peoples DIY fashion projects too. You can share them on the Greenie Dresses for Less facebook page. Click on the facebook icon to the right of the blog to go there. ﻿Right! On to this week’s idea. The splattered paint print has been hot for a while now. I don’t hate it, but I can’t see myself in a neck to knee dress with the print. An small way to incorporate this on trend look into a wardrobe is to wear a scarf with a painterly print. I have shown how to make no-sew scarves in a previous post. The link is here – DIY no sew scarf. For this scarf, all I did was buy some paint splash print fabric and wear it as a scarf. Easy as that! Another version of the easy no sew scarf is here – easy no sew scarf. 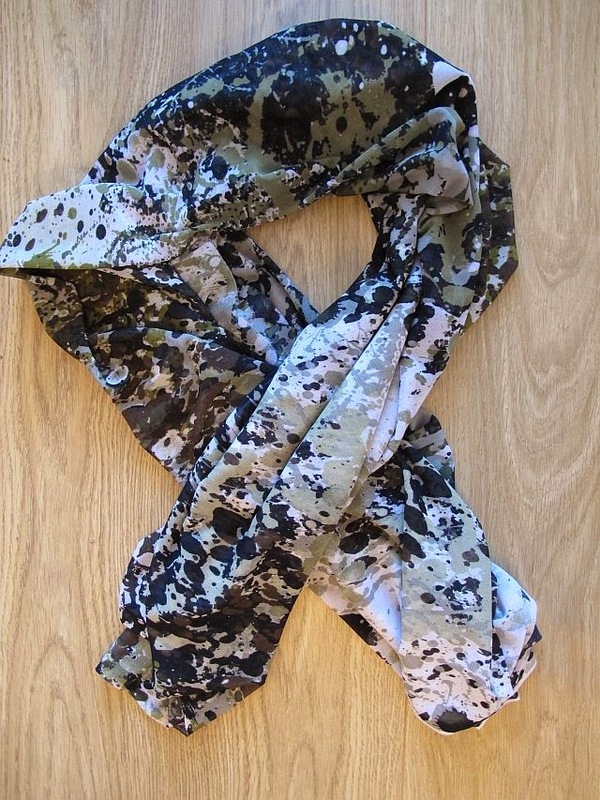 Want a Kate Moss style skinny scarf? Hit this link – DIY skinny scarves. Another way to wear a skinny scarf is here – wearing a skinny scarf. How about wearing your scarf as an OBI style belt – DIY fabric waist tie. Try wearing your scarf as a turban – DIY turban style scarf. Tie a luxe scarf to your handbag for an upmarket look – amp up your handbag with a scarf. For a tie dye effect scarf from an old sheet read this post – DIY tie dye scarves. Sew tassels or pom poms to scarves for a boho update – DIY tassel and pom pom scarves. Why not work Alexa Chung’s fashion favorite look with a ribbon necktie – DIY ribbon necktie. And lastly I show how to wear a scarf as a summer top in these two posts – DIY halter top from a scarf and silk summer scarf as a top. At the top of this page are the Greenie Galleries, an archive with pics of older and newer projects and links to each post. I will have more for you next week. I love your blog! Thanks for all the good tips! Thank you. Great to have feedback. Greenie.